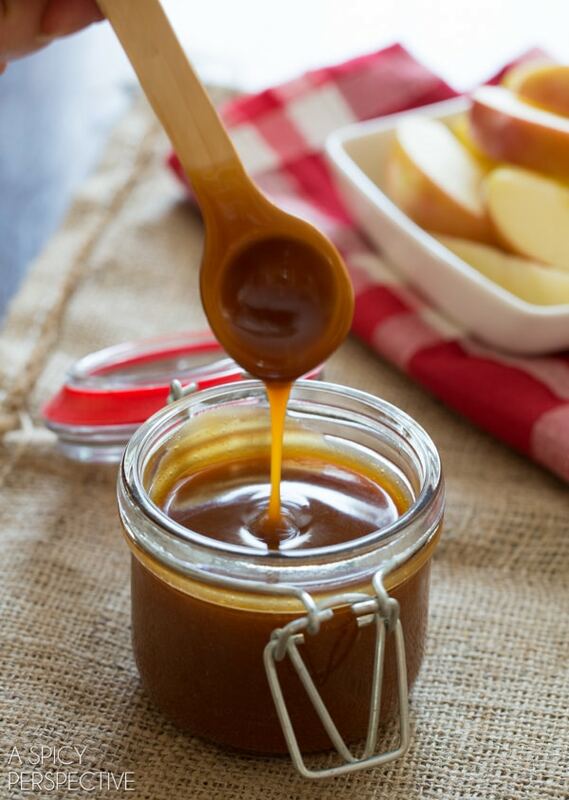 Luscious Salted Caramel Sauce to serve over desserts and fruit, or jar for edible gifts this fall. 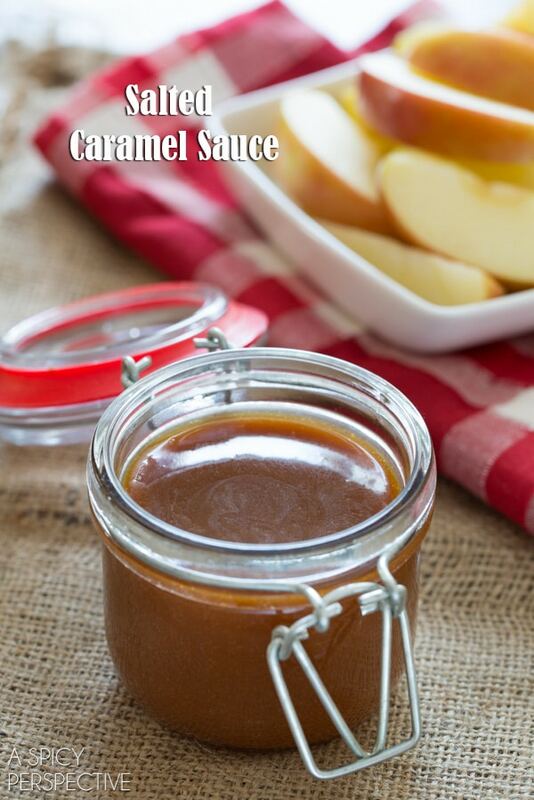 This caramel sauce recipe is so easy, you’ll make it again and again! There are some things worth buying pre-made, and some things worth making from scratch. Salted Caramel Sauce is the latter. 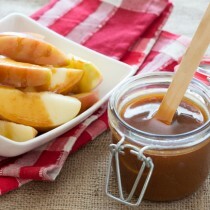 You can make a lighter caramel sauce, or dark caramel sauce like mine. You can make salted caramel sauce really salty, or just a little salty. You can even adjust the thickness by adding more or less cream and butter. When it cools, it firms into a creamy dreamy spread you could slather on bread or pound cake. 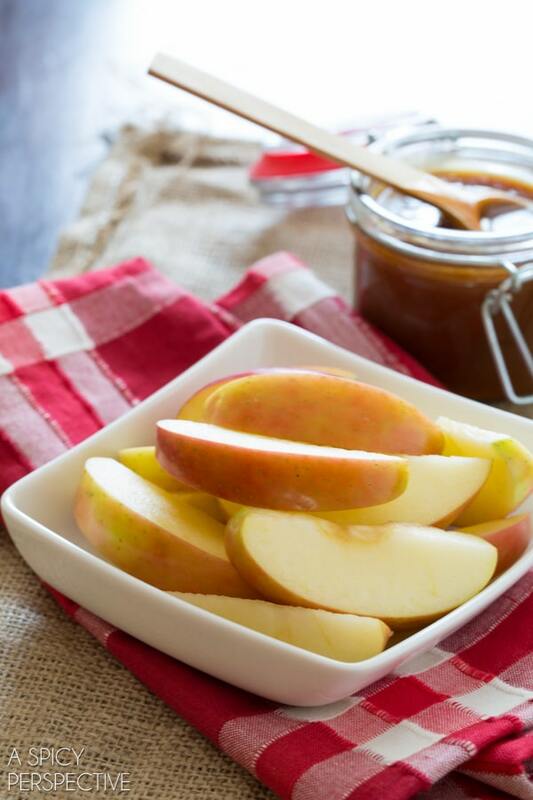 Yet when it’s warm, drizzle it over fresh fall apples, ice cream, pancakes, or anything else that would benefit from a kiss of caramel. Best yet, you can produce jars and jars of it as edible gifts this season, on a very small budget. If you love delivering goodies to your friends and neighbors, imagine what jars of homemade salted caramel sauce with a ribbon on top might do. I gave a few jars of this sauce to friends last week and you would have thought I had given them a brand-new car! So throw away your copy of How to Win Friends and Influence People and invest in sugar and cream. You are guaranteed be the most popular person on the block. Pour the water in a medium heavy-bottom sauce pot. Place over medium heat and add the sugar. 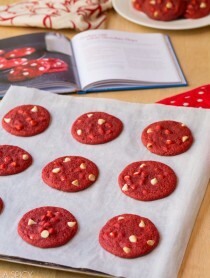 Watch closely while the sugar dissolves and darken, 5-10 minutes. The moment the sugar darkens to your desired color (somewhere between golden-brown and medium brown) remove from the heat and whisk in the heavy cream. *Darker caramels are really flavorful, but don’t let the sugar get too dark, or you’ll have to start over. Once the cream is incorporated, stir in the butter, salt and vanilla until smooth. Serve warm, or jar and refrigerate until ready to use. I made this twice this weekend and it was very thin. Really good, but thin and light in color. While the sugar is dissolving in the pan in the water, should I just be leaving it or stirring? Also it gets difficult to see color as it lightly boils and makes an almost “foam” on top. Do I just need to wait longer and that will go away? Thank you! It was still amazing!!!! Are you whisking it before you add the cream? The reason I ask is mine NEVER foams prior to adding the cream. I’m wondering if you are whisking or stirring vigorously and that is creating the foam. I usually add the water and sugar, swirl once or twice, and let it darken to a medium-dark brown. Then when I add the butter and cream, I whisk while it boils up to incorporate. That lightens the color a tad, but it still stays a medium brown. I made this … but my first attempt the sugar did not brown so I left it on the stove longer and the sugar formed a hard mass… I started over and left it on the stove only 10min… it is light yellow in colour but tastes great. It is still warm so I am hoping it will thicken up. How can I get the sugar to brown ? Hi Lisa, Did you add the water to the pan with the sugar? That usually makes the biggest difference for me. I have tried caramelizing sugar without a little water and it always goes down hill. It seems runny at the end though, not nice and thick like in your picture – more like water. Do you cook it more after you add the cream? Hi There! Has it had time to cool down a little? It will be runny right as it comes off the stove, but should thicken as it cools. I think this would be great poured over a warm white or chocolate cake or popcorn. This looks amazing! After refrigerating, does the it warm up well again? How would you recommend reheating it? I am loving everything about this! So delicious! Can’t wait to try this! What percentage is “heavy cream”? I can only find 10% and whipping cream. Thanks! Hi Paulina, “Heavy Cream” generally means 36% milk fat or higher. You could use whipping cream, but add just a little less. I just made this and my kitchen smells wonderful!! And it was quite easy to make as well. One question: When I poured in the cream, the sugar crystallized into threads. So I put it back on the warm stove and stirred until it dissolved again. But did I do something wrong? Hi Rachel! The only thing I can think of is that you need to pour in the cream immediately after you turn the heat off, and whisk a little more vigorously. It sounds like the caramelized sugar cooled a little before you added the cream. Is that possible? An even easier way. 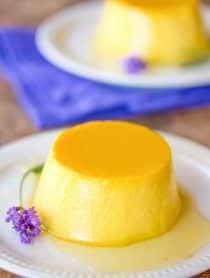 Take a can of sweetened condensed milk (concentrated milk and sugar are the only ingredients). Place it unopened into a crock pot. Cover it with water and cook on low for 8 hours. Make sure it stays covered with water. That’s it, you have caramel sauce. I keep seeing this ‘recipe’ for sticking the can in the crockpot, however note that neither Nestle (Carnation) or Bordon recommend cooking the sauce in the can. Hi Marie, I boil cans of sweetened condensed milk for dulce de leche, but there is some risk involved. You HAVE to make sure the cans stay completely submerged in water the entire 3-4 hours of simmering, or they could explode. (Can you even imagine?!) I only do it when I’m going to be in the kitchen for an extended period of time and make sure to add hot water to the pot as needed, and keep at least an inch of water over the tops of the cans. Hi Leigh, I make Dulce de Leche the same way as you, but this salted caramel sauce recipe is not nearly as thick, and it has a fresher taste. How long can this be stored for? Does it have to be refrigerated or is it shelf stable? This sounds delicious! Hi Darina, You could try it with thick canned) coconut milk. I’ve heard of this method, however I’ve never tried it myself so I can’t vouch for the taste of texture. How long will it keep one refrigerated? Sounds very interesting and so easy to make. 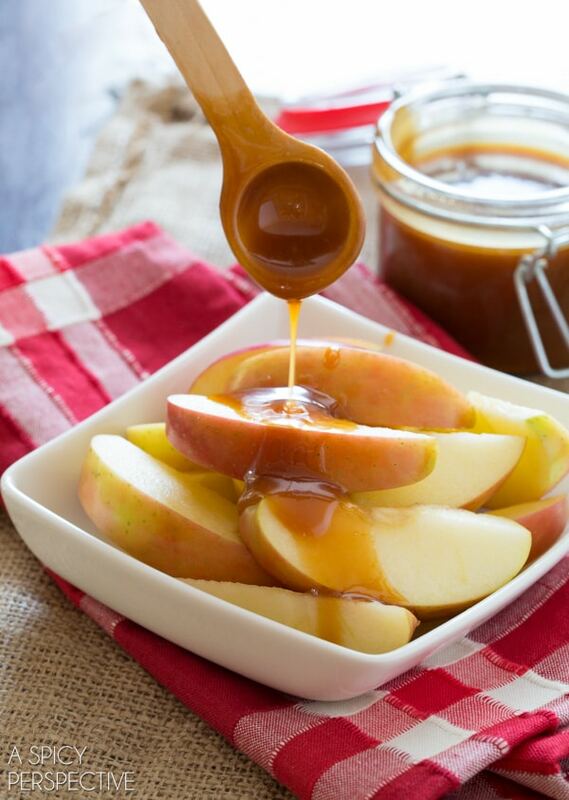 Caramel dipped apples is the best thing about fall! I need to make this now! I am so so glad salted caramel has become so popular—actually giving chocolate a run for its money. I love it. I tried to make a salted caramel sauce this past Friday but my patience led me to a light yellow color of sugar. No caramel I need to try again. oooh I’ll have to give this is a shot! It looks so simple! Do you add in the butter when the pot is off the heat too? This needs to be poured over everything in sight! caramel sauce is the best thing EVER! Homemade caramel sauce is so worth the small amount of effort. Love this. What a great fall gift! I love anything with caramel!! Can’t wait to try this sauce! Looooove caramel sauce! So good! 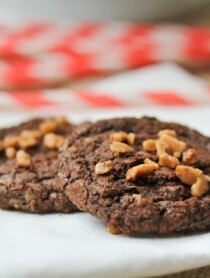 I would love to receive a jar of this homemade deliciousness! This looks so easy and good! The perfect sauce for fall! Oh Sommer, I’m loving this! I have to make this, my daughter (and I) love salted caramel, and this would be such a great hostess or holiday gift to a foodie!